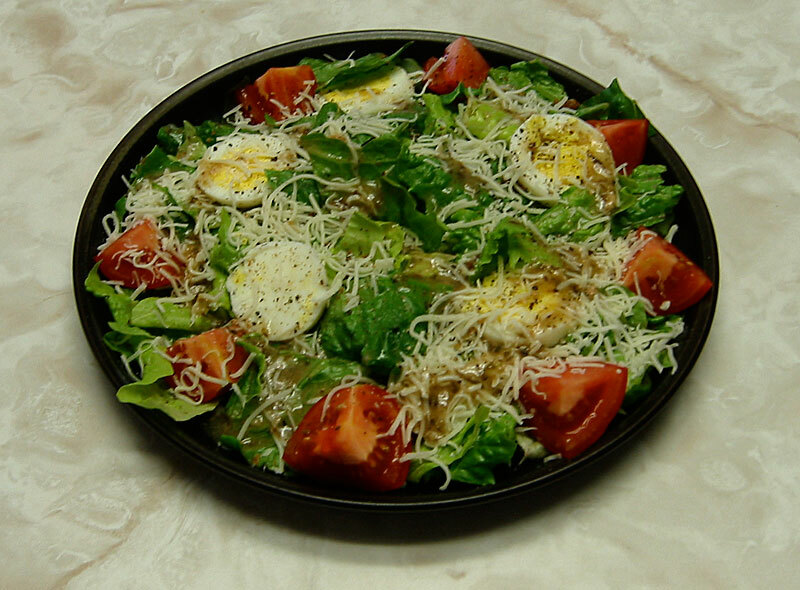 It's been a while since I've posted anything I've cooked or baked, so I thought I would throw in a photo of the yummy salad I put together for dinner last Sunday. It's a mix of red curly leaf lettuce and romaine, with a slices of a hard-cooked egg (I steam them after seeing it in an Alton Brown cookbook), wedges of vine tomatoes, a sprinkling of shredded Italian cheeses, some cracked black pepper and a low-fat Greek salad dressing. In hindsight, I should have added a little of the prosciutto still in the fridge, but it was still quite tasty without it! Grand total - 340 calories. 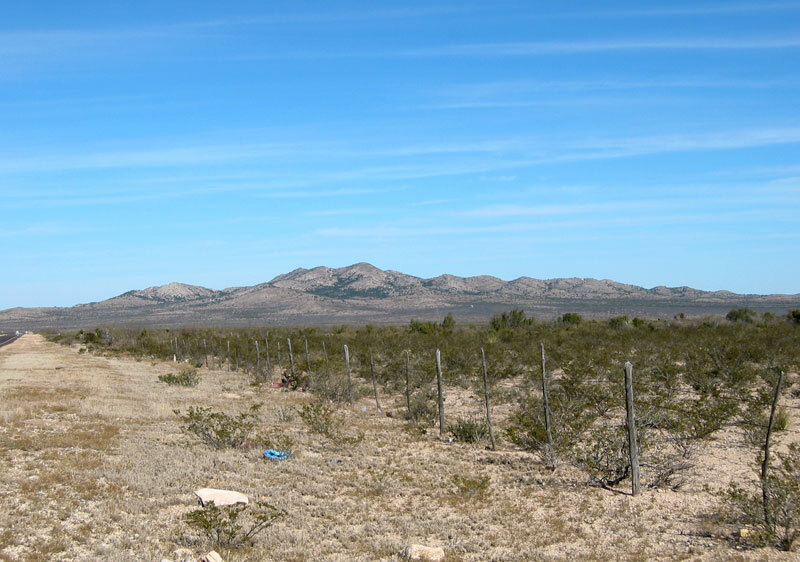 Central peak of the Sierra Madera impact crater in Pecos county, Texas. December 2003. In the fall of 2003 I took a class on the geology of Texas with my Staff Education Benefit, which was very fun and informative. As part of the course, we had to do a research paper on some aspect of Texas geology. The professor had a list of topics that people tended to choose from, but we had the option of suggesting our own topic. I had a growing fascination with Earth impact craters, and I knew of several in Texas, so that was what I proposed to do my paper on and it was accepted. It was a lot of fun to research and put together. Shortly after the end of the semester, I went out to McDonald Observatory and on the way back we stopped and took photos of the central peak of one of Texas' impacts - the approximately 100 million-year-old Sierra Madera crater, which is pictured here. 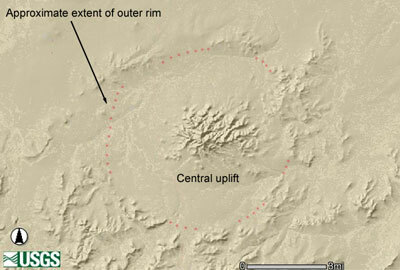 Below is an image I made for the paper from the USGS National Map Seamless Server which shows the rim of the crater, which of course is heavily eroded. I meant to write about this shortly after the talk so I wouldn't forget stuff, but of course here I am over two months later trying to remember all the mind-bending (and space-time bending) things he discussed. 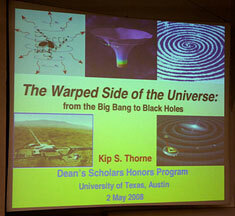 Kip gave a lecture at UT back when I was a student (c. 1993? ), so that was the last time I heard him speak in person. This time he came after being invited by two undergraduates, one of whom was my department's recently-selected Rhodes Scholar Sarah Miller (we're all quite proud of her!) and he made a point of mentioning that the reason he accepted the invitation was because it was students who asked, which I thought was very cool. The talk was a good overview and synthesis of where we've come from and where we are going in the study of some of the weirdest parts of physics and cosmology. 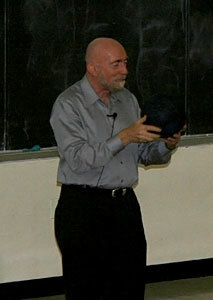 He started with an overview of relativity, black holes and the big bang and evidence for all of these. He spent a bit of time covering the search for gravity waves (which I think is what he talked about back in the 1990s when I last saw him) and the plans for upgrades to LIGO. He also spoke to the future areas of research for the primarily student-populated audience, especially areas like inflation and grand unified theory. In honor of yesterday's anniversary of the first Apollo moon landing, here is a photo from the National Air and Space Museum Steven F. Udvar-Hazy Center of the Apollo Boilerplate Command Module. I visited the center in September 2006, which was my first visit to the new facility, which is amazing to an air and space junkie like me. NASA built several "boilerplate" Apollo command modules for testing and to train astronauts and other mission crew members. This one is made of aluminum with a fiberglass outer shell and has an actual command module hatch. It was used by Apollo astronauts, including the crew of Apollo 11, the first lunar landing mission, to practice routine and emergency exits. 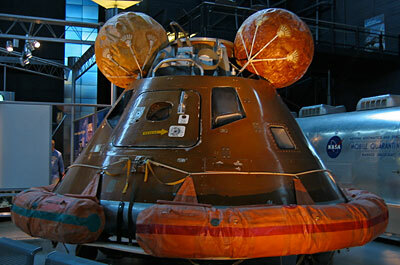 The interior was later fitted with actual or mockup components to simulate the Apollo-Soyuz spacecraft and the five person rescue vehicle planned for use if an emergency developed during the Skylab program. Boilerplate #1102A is displayed here with the flotation collar and bags that were attached to the Apollo 11 command module Columbia when it landed in the ocean at the end of its historic mission. 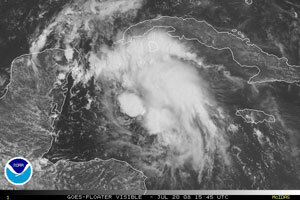 Yes, I know I won't be the first or last person to say that in regard to the new tropical storm that formed just east of the Yucatan peninsula. The storm is expected to move into the Gulf of Mexico in the next couple of days. Right now the track takes it into Texas at the Mexico border as a tropical storm. 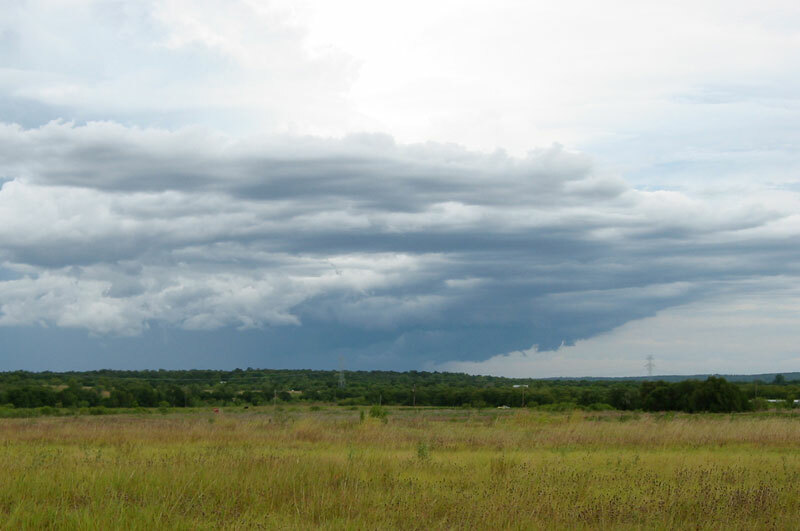 The reasons for this little bit of weather-blogging are 1) I'm a weather junkie and 2) I was born in the Rio Grande Valley of Texas and lived there and in Houston for the first 8 years of my life, so keeping an eye on tropical weather was something I got from an early age. Even now, living in central Texas, we still have to deal with tropical weather, and not just from the stuff that comes in from the Gulf. We sometimes get the remnants of Pacific storms coming in from Mexico and dumping lots of rain on us. Since we're having a pretty hot and dry summer here this year, a nice soak from a minimal tropical storm wouldn't necessarily be a bad thing. Right now the forecast doesn't take Dolly to hurricane strength, so maybe she'll turn out to be one of those helpful storms. But of course, we all know how quickly the forecasts for the path and strength of a storm can change! Well, Dolly has now come and gone, leaving a lot of rain in the Rio Grande Valley. We got some here in Central Texas (see the view from my back porch on Wednesday evening), but not as much as I had hoped. It looks like the Valley took a fairly bad hit, but so far I haven't heard anything of deaths or serious injuries, so that's good. The trend is pointing towards an active season, although I can't imagine that we will see anything like the historic 2005 season. Only time will tell, but let's hope that if it is a repeat of the 2005 activity, it isn't also a repeat of the failures of that hurricane season. Won't somebody please think of the produce? I think this is fruit and vegetable abuse. I think "the good, the bad and the ugly" would also sum up the evening. The "good" was the round of applause for Chris Comer and her upcoming lawsuit and hearing some ScienceBloggers speak, "the bad" was hearing more about the big fight that will be coming over the revision of the science standards here in Texas, and "the ugly" is how the upcoming fight is probably going to be. The two folks from ScienceBlogs were Ed Brayton from Dispatches from the Culture Wars and Josh Rosenau of Thoughts from Kansas. The third speaker was Steve Schafersman of Texas Citizens for Science. Josh wrote up a post about the evening, with photos. The travesty of a law supporting "academic freedom" signed by Gov. Jindal in Louisiana is probably going to show up in Texas in January when our legislature meets again. The only way I can see this being derailed would be if a lawsuit has been filed and lost in La. before ours debuts, but I don't think there would be enough time for that. So, we have the "strengths and weaknesses", but at least there is the "using scientific evidence and information" as a caveat. The other thing that will be interesting to watch in the near future is Chris Comer's suit against the Texas Board of Education for having to resign for not remaining "neutral" on the topic of evolution, which you can read about at the Wikipedia link up above. These are all things that I'll be trying to follow and blog about over the upcoming months. I paid off another credit card today! Well, sort of. Actually, I balance transferred the remaining amount on one card to the card that I paid off with my $600 economic stimulus check. There were two reasons I decided to do it. The first was that the offer was 6.99% for a year with no transfer fee and the second was that it meant that was one less credit card I have with Chase. I know many people have various banks/cards they dislike with a passion, and mine is Chase for the simple reason that they treated me like crap. Unfortunately I still have one card with them, but that one is next on the chopping block and then it will join its two previous siblings in the confetti pile. It all started a couple of years ago when Chase, over a few months’ time, raised the rates on all three cards I had with them to the default rate, which was 29.99%. Was I late with a payment? No. Was I late with another card or my car loan? Nope. Did I go over my credit limit with them or another card? Again, no. The SOLE reason that they decided to essentially double my interest rates on the cards was that I had too much debt. So, in their computer, that made me a “risk”. Note that I always made more than the minimum payments on all my credit cards (not by much sometimes, but still always greater than the minimum) and by raising my rates they made it all that much harder to make the payments. So I really wasn’t at risk of not being able to pay the cards until THEY put me at risk by raising my rates (and therefore my minimum payments). Please explain the logic of that to me??? Yeah, I know, that’s just the way credit cards work. My Discover card did something similar, but not quite as high as the Chase rates. (Discover, though, will be next on the chopping block after the Chase cards go!) Meanwhile the rates on my Citibank cards have dropped and they raised my limit on one of them. Go figure. The funny part is that I was going to have that Chase card paid off in about three or four months anyway, so I’m not really saving a whole lot by transferring (about $50 over the remainder of the time to pay it off), but boy did it feel good. I’ve been trying very hard to pay off my debts over the past year or two and I’m starting to make some headway, which feels good. I don’t care if anyone reads this blog post, it just felt good to write it! I’ve been reading some personal finance blogs lately and I’m inspired by some of the stories of people who have been able to eliminate debt in their lives. Hopefully I’ll be joining them in the next couple of years! Dome of the 2.7-meter (107-inch) Harlan J. Smith Telescope on at McDonald Observatory, near Fort Davis, Texas. December 2003. While I am working on some real content posts, I thought I would go ahead and start my Picture of the Week series. I mainly plan to use my own photos to start, but I might slip in a NASA image or something from time to time. 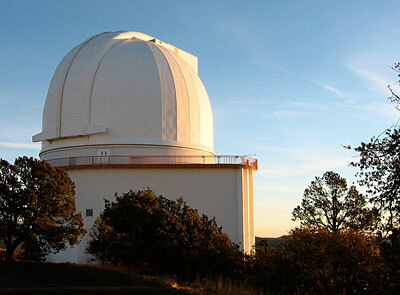 This week is the dome of the 2.7-meter (107-inch) telescope at McDonald Observatory, constructed in the 1960s. The telescope was re-dedicated in 1995 in honor of Harlan Smith, the late Chairman of the Department of Astronomy and Director of McDonald Observatory. Ugh, I know I'm a native Texan and all, but this summer has already been really annoying. I'm sure most of it has to do with how wet and relatively cool last summer was, making this hot and dry one extra bothersome. We've been having some spotty showers for the past week or so, but they've all managed to not rain on Elgin. I got a brief shower one day on my drive home, but it was just enough to coat the car in a thin layer of dust-mud. 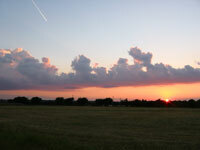 But, on the upside, the distant showers have left us with some cool sunsets. I'll have some new ones posted on my Flickr pages soon.